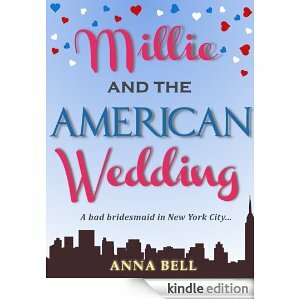 Millie and the American Wedding is the debut novel by Author Anna Bell. This is a story about a young woman called Millie, living in the UK who receives through the post a Fridge Magnet for “Save the Date” for the upcoming Wedding of old college friends Kristen and Joel. This really should be really exciting but there are a couple of problems, the wedding is in America, she slept with the groom whilst at College and her ex boyfriend, who broke her heart is married to the dragon who is the Maid of Honour. Everything is telling Millie not to go, but all America is a great place for some shopping! Will the past stay in the past where it belongs or will a whole week of wedding activities and events send Millie running for the airport? This story had me in stitches in places and hiding behind my hands in others. Anna has really captured the mood of how Millie is feeling and the apprehension she has around attending this wedding. It really is a very funny book with lots of laugh out loud moments. Beautifully written and certainly is a fabulous Chick Lit that I could see so easily working as a RomCom movie. Loved it! I listened to this book in July 2011 via a free podcast on iTunes read by the Author Anna Bell (Anna does apologies for her attempt at an American accent!) However this book is now available as an eBook and I think if you like a funny book that hooks you straight away, this is for you! This sounds fabulous, Louise. A great summer read, or any season for that matter. I’ll definitely be getting this one. Thanks for the recommendation. OOps that was supposed to say blog not blob. Yikes! What a crappy first impression. Not in the habit of being a pest, but there is a first time for anything….where can I get this book….not on Amazon. This sounds great! I can’t wait to check it out! Ooo I am liking the sound of this one!! One for me for sure!! Well done Anna and a great review Lou! Anna Bell has confirmed that this book should be available as an eBook around September.